Two myths persist concerning the role played by Charles Darwin as a geologist in Africa during his epic voyage around the world (1831-1836). The first myth is that Darwin was a completely self-taught geologist, with no formal training. The second myth is that it was Darwin who finally solved the problem of the granite-schist contact at the famous Sea Point coastal exposures in Cape Town, after deliberately setting out to prove his predecessors wrong. These myths are challenged by the now ample evidence that Darwin had excellent help in his geological education from the likes of Robert Jameson, John Henslow and Adam Sedgwick. The story of Darwin and his predecessors at the Sea Point granite contact has become confused, and even conflated, with previous descriptions by Basil Hall (1813) and Clark Abel (1818). Here, the historical record is unravelled and set straight, and it is shown from the evidence of his notebooks that Darwin was quite unaware of the outcrops in Cape Town. His erudite account of the contact was a result of the 8 years spent in writing and correspondence after his return to England and not because of his brilliant insights on the outcrop, as the myth would have it. While there has been little to indicate Darwin's landfalls in Africa, a new plaque now explains the geology of the Sea Point Contact, and includes a drawing of Darwin's ship, the Beagle, and quotes from his work. The bicentennial of Charles Darwin's birth in 2009 has provided ample opportunities to consider his unsurpassed legacy. For us in South Africa, there is a sense of pride in the role that Africa has played in human evolution, and of Darwin's role in uncovering some of this history. Darwin's brief visit to the Cape during his seminal voyage on the Beagle has been rightly commemorated in numerous special exhibitions and lectures throughout the country.1 It is not surprising that while many serious accounts of him today border on the hagiographic, some popular accounts, based on secondary sources, are downright inaccurate, or simply wrong. In the process of glorifying Darwin and celebrating his legacy, a number of errors and inaccuracies have become perpetuated as myths. It is my purpose in this article to critically examine a couple of the myths about Darwin, specifically those that revolve around his role as a geologist in Africa. It is also my intention to untangle a confused knot that has been woven around Darwin's role, vis-á-vis his predecessors', in deciphering the Sea Point granite-schist contact in Cape Town. While Charles Darwin (1809-1882) became world renowned as a biologist with the publication of On the Origin of Species in 1859, there are few who are aware that he was also an accomplished geologist. As naturalist for the Beagle voyage under Capt. Robert FitzRoy from 1831-36, Darwin developed a fascination for geology. Despite his lack of any formal training but as a result of his meticulous observations, Darwin published several major works on subjects as diverse as the structure and distribution of coral reefs (1842), geological observations on volcanic islands (1844), and on various aspects of South American geology (1846). Although he was self-taught, his contributions and influence were considerable: for example, he was the first to propose that subsidence and uplift might be a major geological phenomenon. In February 1859, when he was 50 years old, the Society presented him with its highest honor, the Wollaston Medal, for his outstanding contributions to geology. The reality is that Darwin's introduction to geology came in the form of lectures at the University of Edinburgh between 1826 and 1827, presented by the Professor of Natural Philosophy, Robert Jameson. It is well known that Darwin disliked these lectures very much, as he wrote that he had found his lectures on geology and zoology 'incredibly dull'3. Darwin added that 'the sole effect they produced on me was the determination never as long as I lived to read a book on Geology, or in any way to study the science'3,4. It was only under the influence of Lyell, whose Principles Darwin had with him on board the Beagle, that Darwin re-ignited his interest in geology that had been so thoroughly snuffed out by Jameson. While few further details are given by Darwin about his geological studies under Professor Jameson, they must have involved the study of mineralogy and of rocks and their classification. His geological education also involved visits to famous field exposures around Edinburgh, including the Salisbury Crags (immortalised by James Hutton), which were usually visited by Jameson's classes. Darwin was particularly unimpressed with the Neptunist Professor Jameson's interpretation of a 'trap-dyke, with amygdaloidal margins and the strata indurated on each side', at the Salisbury Crags, as a 'fissure filled with sediment from above'4. Darwin's geological work on the voyage of the Beagle was documented in his Geological Observations on Volcanic Islands.15 Over the past several decades, much has been written about Darwin's work as a geologist.16,17,18,19,20,21,22 Few 'amateur' geologists could have had as privileged a start to their geological careers as Darwin had, with the training he had received from such eminent authorities as Jameson, Henslow and Sedgwick. It must also be borne in mind that while the young Darwin of the Beagle voyage was a relatively inexperienced field geologist, he was a superb observer, and he used his limited field training to maximal advantage. The field observations were then digested and mulled upon over the next 8 years, and especially during the 18 months that occupied the writing of his Geological Observations on Volcanic Islands,15 when he had had time to read in his extensive library at Down House and correspond with other eminent authorities.23 Thus his published works in geology (and biology) are a lot more polished, and erudite, than his field notes,24 and give the impression of much greater learning than he had actually possessed at the time of making the observations. The second myth is that Darwin was the geologist who finally solved the problem of the intrusive origin of granite at the Sea Point Contact in Cape Town - after deliberately setting out to prove that those who came before him were wrong or confused. Just off the promenade at Queen's Beach in Sea Point is a bronze plaque commemorating a visit by Charles Darwin in 1830. HE SAW THE POINT. During his epic voyage around the world in the HMS Beagle, Darwin stopped here and made a set of key observations of the contact zone between the Cape Peninsula Granite and the adjacent Malmesbury Group sediments. His careful description of this 'Sea Point Contact' provided irrefutable evidence for early geologists to prove that granite is an igneous rock emplaced within older, pre-existing rocks. Many of Darwin's contemporaries believed that granite was a sedimentary rock, deposited in water like sandstone. A close examination of the relationship between the two rock units at Sea Point provided Darwin with ample evidence that he eagerly passed on in a letter to his friend, geology professor John Playfair, in Edinburgh, Scotland. He suggested that as magma rises through a host rock, pieces of the host (in this case, Malmesbury greywackes) often break off and fall into the magma where they generally melt and dissolve. Occasionally a fragment successfully resists redigestion and is preserved as a remnant 'xenolith' once the granite solidifies. Darwin's genius, or was it Captain Basil Hall's? Historically geologists questioned the origin of granite: did it come up from the depths or was it formed in situ as a precipitate from sea water? The debate was raging at the time Charles Darwin was on his travels, and he decided to visit an outcrop at the Cape of Good Hope that might help resolve it. More than 30 years later, Darwin walked over the same contact. After careful scrutiny, he found himself in agreement with Hall's interpretation of granite intruded into the fragmenting 'roof' of schist, with fragments and slivers of the latter ripped off, and 'floating' in the granite. To Darwin, this interpretation was infinitely more plausible than the alternative - then still popular - notion of the granite formed by conversion of the schist. The 545 million year old contact of the Cape granite and the surrounding Malmesbury shale is beautifully displayed at the Sea Point Contact. The contact shows the complex interjection of molten rock along the bedding planes and the disruption of the rocks as they were intruded. The contact was first described by Basil Hall, a sea captain who was probably on the look-out for such rock types as he was the son of James Hall who was busy melting rocks experimentally in Scotland. ...The debate between Plutonists and Neptunists persisted to the extent that Charles Darwin was compelled to visit the Sea Point contact in 1836 and later wrote of his observations there to argue against the view of a Neptunist holdout. Again, there are many inaccuracies and confusions in the above accounts. The impression is given28,29 that Darwin had described the same outcrops as Basil Hall. However, Hall had described the granite-schist contact at Platteklip Gorge, some 5.2 km south-east of Sea Point. Furthermore, it is stated explicitly28 that Darwin visited the granite outcrop at Sea Point because his attention had been drawn to it by Basil Hall's paper, and that he deliberately visited this outcrop29 to help sort out the controversy between the Plutonists and Neptunists, which was still raging at the time of his visit. A similar statement was made by Rogers et al.30 who, while correctly pointing out that Hall and Darwin had seen the granite-schist contact in different places, stated that 'Darwin sought out the igneous contact already made famous by Hall and Playfair, and provided in his diary of the voyage a detailed account of his observations at his Sea Point contact'. The fact is that an examination of his field notebooks24 shows that Darwin was quite unaware of this contact, and of Playfair and Hall's paper (which had been read by Playfair before the Royal Society of Edinburgh (not 'the Royal Society'28), at the time of his visit to the Cape and that he was shown the outcrops by Dr Andrew Smith.15,24,31 Lyell32, in the third volume of his Principles of Geology (which Darwin had obtained during his voyage on the Beagle), did mention Hall's description of intrusive granites at the Cape, but he did not refer to Abel's account of the contact exposed at Sea Point. Darwin published his account of Cape geology in 1844,15 32 years after Hall's visit, and 31 years after Playfair and Hall's paper27 was published; however, Darwin actually visited and 'walked over the same contact' in 1836, 24 years after Basil Hall saw his outcrops at Platteklip Gorge (not 'more than 30 years later'28). Finally, it should be reiterated that Darwin did not interpret schist fragments in the granite as detached xenoliths 'floating' in the granite - he saw them as interconnected pendants of the overlying roof of schist, which was intruded along schistosity planes by the granite; the deep erosion level gave rise to the appearance of schist fragments 'floating' in the granite. In several parts of the world, geographical features honouring Darwin include the city of Darwin in Northern Territory, Australia; Mount Darwin and the Darwin Crater in Tasmania, Australia; the town of Darwin in the Falkland Islands; the Monte Darwin in Chilean Tierra del Fuego, and the Canal Darwin in the fjorldlands of south-western Chile. On the moon there is an impact crater named after Charles Darwin (another crater called Darwin, on Mars, is named after George Darwin, mathematician son of Charles). There appear to be just two geographical features in Africa that are named after Darwin, both in northern Zimbabwe: Mount Darwin (16°48'S; 31°30'E) and the Darwin Gorge on the Angwa River. The hunter and adventurer Frederick Courteney Selous named Mount Darwin after 'an illustrious man whose far-reaching theories have revolutionized modern thought, and destroyed many beliefs which have held men's minds in thrall for centuries'33,34. Ironically, there are no geographical features named after Darwin in the African countries and islands that he had actually visited (Cape Verde Islands, Mauritius, South Africa, St. Helena and Ascension Island). On the outward bound voyage, the Beagle, which had departed Plymouth on 27 December 1831, passed Madeira and Tenerife, and made its first landfall on 18 January 1832 at Porto Praia, on the island of Santiago in the Cape Verde Islands. The ship stayed at anchor in Praia for 23 days, and departed for Brazil on 08 February. During the time in Praia, Darwin made several short trips to the interior, and made numerous geological and botanical observations on this volcanic island. He revisited the island in 1836 on the return voyage, and his account of the geology of Santiago15 combines observations made on his two extended stays there.35 There is, today, nothing in Praia, on Santiago, to indicate the place where Darwin started his career as a geologist. At the top of the basalt cliffs which form the prominent 'Plato' on which the capital city of Praia is built, there has been erected, facing out to sea, a statue of Diogo Gomez, the discoverer of the Cape Verde Islands in 1460. At the foot of the same cliff, is the first exposure that Darwin ever described and published. This was a contact between an igneous rock (basalt) and underlying sedimentary rocks - a harbinger of Darwin's later encounter with intrusive granite and metasedimentary rocks in South Africa. In Cape Town, the geological exposures where Darwin, on the last leg of his voyage, had made his detailed observations of the intrusive contact at Saunder's Rocks near Sea Point (and which Darwin had called 'Green Point'), were proclaimed a historical monument in 1953,36 and a bronze plaque (mentioned by MacPhee and De Wit25) was erected by the National Monuments Council. In this plaque (based on a description by Alex L. du Toit36), Clarke Abel was accorded the proper accolade for having first described the granite-schist contact, later visited by Charles Darwin. The rocks between this plaque and the sea reveal an impressive contact zone of dark slate with pale intrusive granite. This interesting example of contact between a sedimentary and an igneous rock was first recorded by Clarke Abel in 1818. Since its discovery it has had an inspiring influence on the historical development of geology. Notable amongst those who have described it was Charles Darwin who visited it in 1836. The plaque was also partly illustrated by Viljoen and Reimold37, who erroneously stated that Darwin had visited the site in 1856. 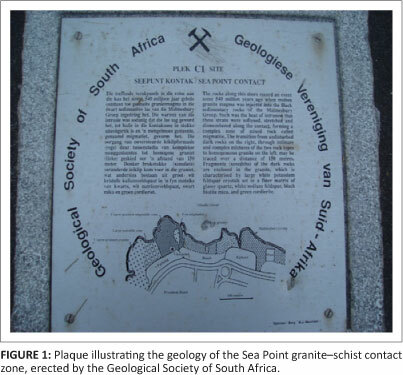 The Western Province Branch of the Geological Society of South Africa erected another plaque37 (Figure 1) describing the geology of the granite-schist contact zone, which, although weather-beaten, still survives. However, the adjacent National Monuments Council bronze plaque was stolen a few years ago, and for some years there was just a barren concrete plinth, with a few rust-stained holes where the screws used to be, with no indication that a luminary like Darwin had ever graced those stormy shores. This important geological site shows how, about 540 million years ago, molten granite intruded into the older, darker, metamorphosed siltstone (spotted hornfels) of the Malmesbury Group (560 million years). Though initially intruded at great depth, prolonged erosion eventually exposed the granite which forms a basement upon which younger (510 million years) sedimentary rocks of the Table Mountain Group were deposited. This contact was influential in understanding the geology of the earth and was first described by Clarke Abel in 1818. It was visited by Charles Darwin in 1836 during his voyage on HMS Beagle. 'A man must for years examine for himself great piles of superimposed strata and watch the sea at work grinding down old rocks and making fresh sediment, before he can hope to comprehend anything about the lapse of time, the monuments of which we see around us'. The Origin of Species, Charles Darwin; 1859. I am indebted to the following colleagues from the University of Cape Town: John Rogers (who first introduced me to the Sea Point granite-schist contact, and to Darwin's role in deciphering its significance); Maarten de Wit (now of Nelson Mandela Metropolitan University, for a copy of the map by MacPhee and de Wit), and John Compton (for discussions). I am also grateful for comments by Sonia Herbert, Alan Morris and two anonymous referees, which helped improve the paper.